Children of the Longhouse introduces twins Ohkwa'ri and Otsi:stia, two children of the Mohawk Bear Clan, who live with their family and other members of their clan in a longhouse in what is now upstate New York. The plot mainly focuses on Ohkwa'ri. First, he overhears a group of teenagers from his clan planning to go to war with a neighboring tribe, thus violating a longstanding peace agreement. Then, after he reports the teens' plans to the council, he finds himself in danger of being attacked by them himself during the clan's game of Tekwaarathon (lacrosse). For the purposes of learning about day-to-day life in a longhouse, this book is ideal. 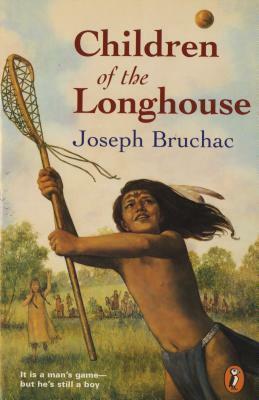 Bruchac is very thorough in his descriptions of the longhouse itself, the roles of men and women (and boys and girls) within the longhouse, and the clan as a whole, and even the experience of playing Tekwaarathon. Unfortunately, there is not enough of a plot to keep readers interested. The conflict between Ohkwa'ri and the older boys is established very quickly, but then developed way too slowly. After the threat of war that opens the book, the lacrosse game, though interesting, feels lame by comparison. I specifically wanted to read a book by Joseph Bruchac, since I have heard such rave reviews about his work, but I have to admit that I was disappointed. I could definitely see using excerpts from this book to illustrate particular aspects of Mohawk living, but it's just too dry to appeal to most kids. I'm sorry to say that when I read Code Talker I often found Bruchac's writing rather dull and slow going, yet other parts were exciting and energetic. Even so, this would have been a good book to read to my kids in school when I was teaching them about the different Native American tribes in New York State.